I hope you all had a lovely holiday season and a good start to the new year! 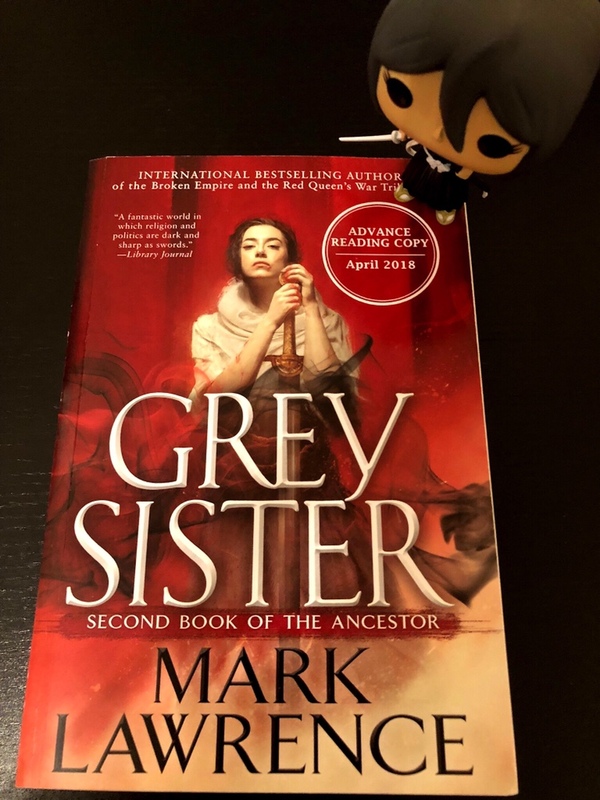 To make it even better I’m giving away a signed Advance Reading Copy of the much anticipated second volume of the Book of the Ancestor trilogy, GREY SISTER, to a lucky winner! To participate simply comment below this post and tell us what made you pick up and read Red Sister! The giveaway will be closing on 31st January 2018 and as usual, I will ask Mark to randomly select a winner. This is, as always, an international giveaway, anyone can enter! And finally, my spoiler-free thoughts on Grey Sister can be found HERE. I had first heard about Mark Lawrence’s work on Goodreads, and even though I had not yet read a book, I was instantly a fan. Prince of Fools was the first book I read and it is now my most favorite book (series) of all time. After reading his first two trilogies, I quickly moved onto Red Sister with excitement. I picked up Prince of Thorns one day in 2014 when was 11 (and just beginning my love affair with books) but I fell in love with the book and Mark Lawrence’s writing. When I came across Red Sister on Goodreads last year I was, let’s just say a bit more than excited. It probably wasn’t, but I felt like the book was made for me. It had a really cool and creative magic system (one of my favourites), it was written from the perspective of a girl (like me! But I’m nowhere near as cool, unfortunately), it was written by Mark Lawrence (quality assured), and most of it was set in a school/classroom (I have a thing for magical schools, probably because of my love of magic and well, school). Once I had the book in my hands I devoured it and that probably didn’t help with my exams but it was worth it. Speaking of school, I really hope that somewhere in these comments is one of my lovely friends, since I won’t shut up about the book. Even my little sister read it and she loved it! The reason I picked red sister up was too simply give something back to mark who has already given me so much in the form of his previous 2 trilogies, red sister could have been blank from cover to cover and I would still have bought it just to say thanks for the hours I have spent in the broken empire, it was a nice bonus that the book was my favourite since the Prince of thorns. Thank you mark. Picked up Red sister mainly because Mark Lawrence wrote it. Was a fan of the past two trilogies. So figured it wouldn’t be disappointing. Looking forward to grey. Because I obsessively buy and read anything by Mark. I’m completed enthralled by all the words and am unable to stop reading anything written by Mark Lawrence. I also purchased the Limited Edition of The Broken Empire and brag about whenever my husband invites people over to our home. I insist they look at it, but they’re not allowed to touch it. That’s what the paperback editions are for.